Today’s debt-service ratios are largely a function of 3 factors: The dollar amount of the debt; the interest rate on that debt; and the amount of disposable income. The logic is that rising disposable income supports rising indebtedness. Some consumers are debt-free and have money and good jobs. Others have large amounts of debt, lousy/no jobs, and are paying for groceries by credit card. Credit problems always involve the most vulnerable consumers. In terms of the burden of debt, let’s look at non-housing consumer debt. To eliminate the effect of interest rates, let’s look at the amount of debt, not the monthly payments, as percent of disposable income. Suddenly, the risks emerge. At year-end 2017, the ratio of non-housing debt (revolving credit—credit card balances, auto loans and student loans) to disposable income reached a new record of 26.3%, up from 23% in 2010, and up from 24% in 2007, the peak before it all came apart during the Great Recession. The ratio of non-housing consumer debt to disposable income—the burden these consumers carry in relationship to their incomes—is higher than ever, and only historically low interest rates have kept it manageable. 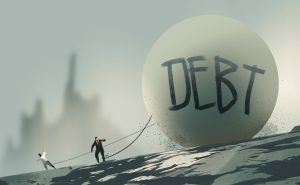 This explains a phenomenon that is already appearing: How this toxic mix of rising interest rates and record-high consumer debt in relationship to disposable income has started to bite the most vulnerable consumers once again. And for them, debt service is getting difficult. In Q1, the delinquency rate on credit card debt at banks other than the largest 100 spiked to 5.9%, higher than the peak during the Financial Crisis, and the credit-card charge-off rate spiked to 8%. These banks marketed to vulnerable consumers that had been rejected by the biggest banks. And now, once again, subprime is calling.